It stormed here yesterday and we got quite a bit of rain. I went out to look at the garden late afternoon and stood amazed by the intensity of the flowers. It seemed like the rain carried a heavy dose of steroids because everything just popped. One of my favorite flowers (I have many) is this little beauty called Love-in-a-mist. Really, could the name be any prettier? This climbing rose is trying to grow over the house. I find myself standing in front of it and just staring, dumbfounded at it's beauty. I've learned that the less I fuss over the flowers, the better they do. 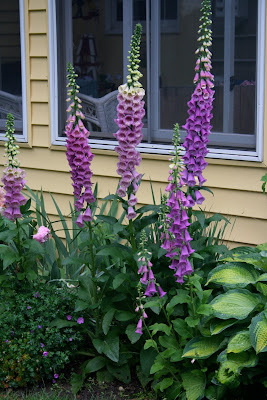 The foxglove are at their peak. The tallest one stands nearly five feet tall, almost as tall as I am. The colors this year are so intense that they almost don't look real. This pink rose will bloom all summer. It came in one of those little pink pots from Home Depot two years ago and now it's threatening to take over the garden. 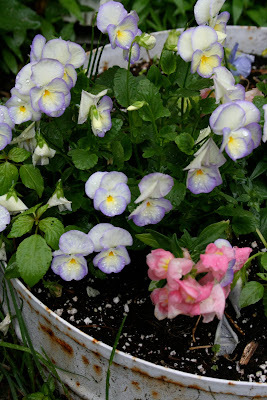 Sweet viola, such cheerful faces greet me every time I go out to water. I do believe that God had a lot of fun making the flowers. I can't even imagine what the Garden of Eden must have looked like. Baptisma, with it's contrasting green to blue to purple is such a pretty flower to have in the spring. 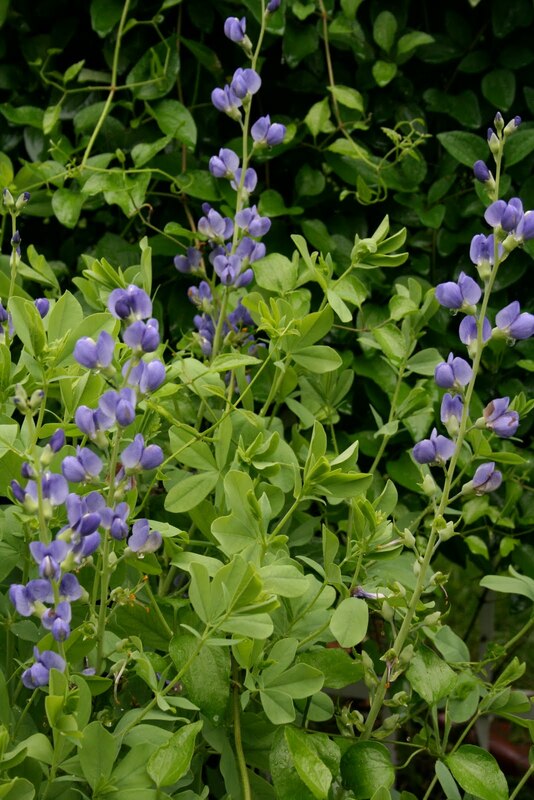 It grows like a shrub and can get quite large. I may never leave the garden today. I might need to do some handstitching outside. Everything looks so vibrant! Pure prettiness! Very nice! I wish you were here to help me with my gardens. How beautiful!! !...yes, I am starting to like more color with my aging...LOL. I am seeing I am ready for all my earth tones to go and more bright colors. I just re-did my bedroom, an older post and I am loving it. I think Robin Egg Blue is going to find it's way into the house on something. Your garden looks like what I want in my dreams one day! your blog is completely adorable! love it, love it all! your garden is lovely, too! Beautiful flowers. 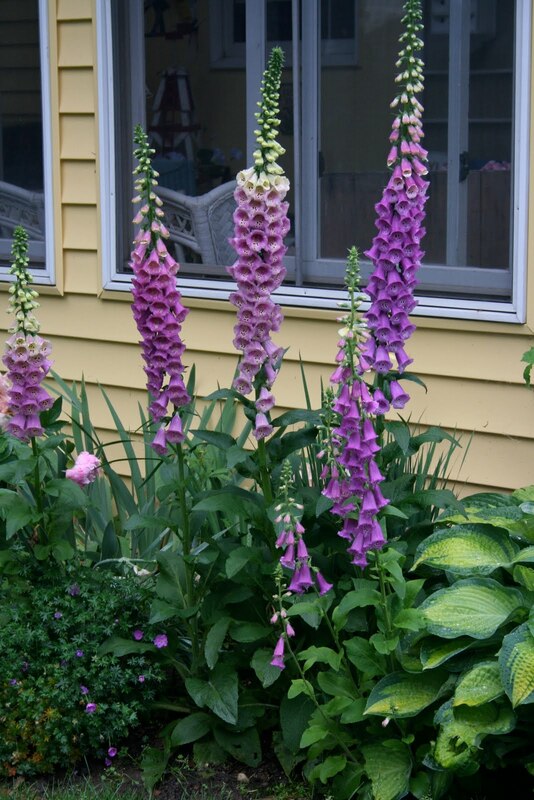 I think Foxgloves are one of my favorites. For some reason I'm drawn to flowers with long spires like Foxgloves, Larkspur, or Hollyhocks. Love in a mist ~ LOVE love in a mist. Mine are about to pop. So much fun, seeing the gorgeous blooming beauty already over here, Renee. 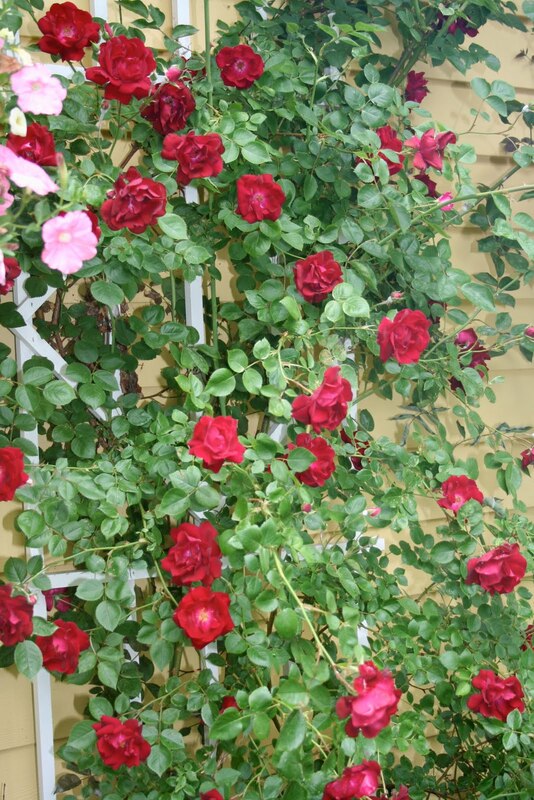 Your garden is a flower paradise! Enjoy Enjoy Enjoy. The day my love in a mist pops, I will think of you. Again, your garden astounds me. It is so pretty. I have never seen "love-in-a-mist" before. I'll have to look for that one. Handwork or reading in the garden sounds heavenly right now. Lovely posies in your gardens.